File Types: JPG,EPS,All Files; File Size: 514.24 KB; Requirements: Adobe CS1+; Vector: Yes. Business man standing and holding job done check sign in hands above his head. Flat style vector illustration clipart. 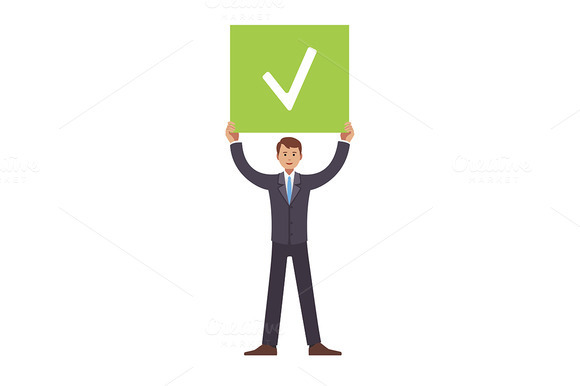 Keywords: flat, icon, vector, object, isolated, illustration, template, background, design, cartoon, metaphor, clipart, concept, business, man, people, person, businessman, biz, office, worker, employee, clerk, manager, management, executive, consultant, lawyer, professional, suit, white, collar, standing, holding, done, plate, sign, get things, success, doer, execution, well, job, banner, great, good, work, tick, check, checklist, above, head, happy, smiling, green, mark, task, to do, up.